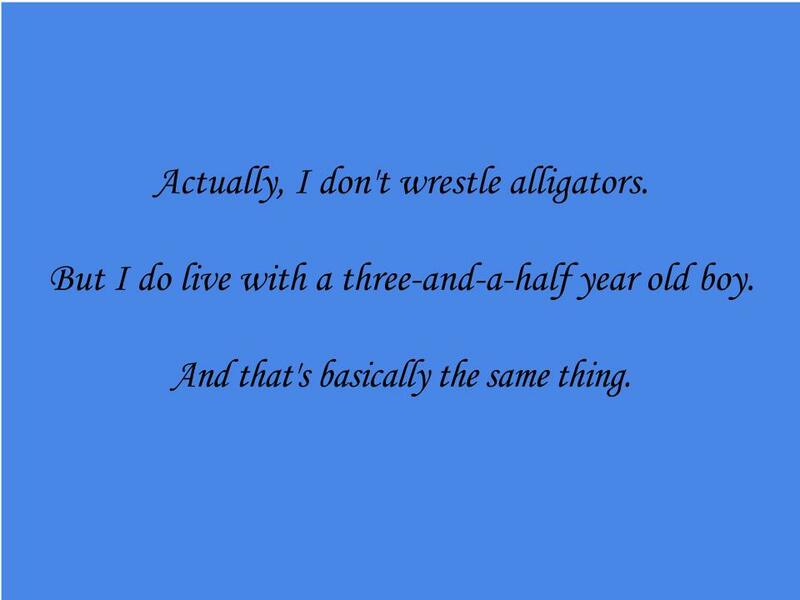 Actually, I don't wrestle alligators. But I do live with a three-and-a-half year old boy. And that's basically the same thing. A few months ago, my husband and I were out on a date. We saw a three-year-old (or so) girl, quietly coloring and playing while her parents ate dinner in a swanky restaurant. "When do you think our kid will do that?" My husband asked. "I don't know, maybe when he's 18..."
So, yeah, this eating out thing is no picnic - there's no room for the boy teating a meal at home felt like we were in prison). And that was when he was the only one. Now, there's the teeny one, who has needs of her own. She eats a bit of what we eat and then...no, no, thank you, I don't want to be in the highchair anymore. o run off to and start building amazing towers or to start "cooking" us a meal. I believe in teaching my children how to function in society, how to be in a restaurant, but that belief doesn't make the process any easier. So, back we go, in a restaurant. 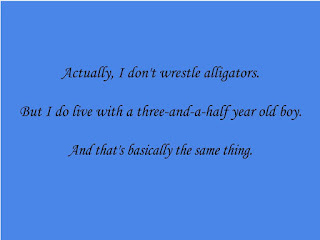 The first time we spent two meals in a restaurant, I turned to my husband and said, "It's like wrestling an alligator." And, it really is. "Little man, are you done?" "I need you to eat all your protein." "I don't like onions. I want salad. Can I have salad? I'm going to beep you." "You might beat me, dude, if you ate more and talked less." "I'm gonna. I'm going to beep you, and then I'm going to watch a movie." And then morning comes, and it's time to get dressed. "I don't want to get dressed." "But you can wear sweats." "I'll get dressed after you get Sissy." "If I get Sissy first, I won't be able to help you." "Okay, I'll get dressed, but don't come in here." "So, you don't want me to help you?" "No, I'll do it myself." "Mommmmmmyyy, I need you to help me put my sweatshirt on." "I don't have any pockets." "Okay, well, you'll need to remember that for tomorrow when you pick out your clothes." "I don't have any pockets. I can't go to school. I need pockets." The crying commences. I handle it with my Love & Logic training. "I can't understand you when you cry." "I love you too much to argue..."
And, finally, we reach school, and he's all cried out. "Do you want a song before you go in?" So, I sing one verse of "Amazing Grace," and he sighs and prepares himself for the day. The music calmed us both down, I think. And again, I've survived the alligator's snapping jaws. I know that 8 hours later, I'll be back in the water, sometimes swimming peacefully, sometimes wrestling, but pretty much always winning. Because he needs me to win. He needs, craves even, boundaries. So, I'll keep wrestling. Our sons are just about the same age- his birthday is June 19, 2012! And your conversations sound eerily similar to mine. I can't tell you how many times he figures out something is wrong with his outfit in the car on the way to preschool and has a melt down. I can totally relate to everything in this post haha! Thank you for commenting - yeah - I try to keep track of all of his little needs, but he's growing up enough that he has to learn to check-in before we leave. It's hard to be 3! When my niece who is now 7 was around 3-5 taking her to a restaurant was an adventure for sure. She was very small for her age so she really needed a high-chair.She hated sitting in it and would whine to get out and then whine about having to sit on a lap. She was the definition of a handful. Now I always feel empathy for parents trying to eat a meal with a child like her. Thank you for "getting" it! My son gave up on high chairs far earlier than he should have, which made dining out even MORE interesting. He's getting better, though! You are so cool! I don't suppose Ive read anything like this before. So nice to find somebody with some original thoughts on this subject. really thank you for starting this up. this website is something that is needed on the web, someone with a little originality. useful job for bringing something new to the internet.